Riot Games walked into a PR blunder by excluding those who identify as men from a panel they set up for PAX West. Cue row and internet rage. Cue fans and Riot staff going back and forth in threads and tweets. Cue facepalms from onlookers. If you by some chance missed the controversy surrounding Riot Games at PAX West 2018, the situation has only got more bizarre as Riot finds itself seemingly in open conflict - via staff social media - with members of the online community. 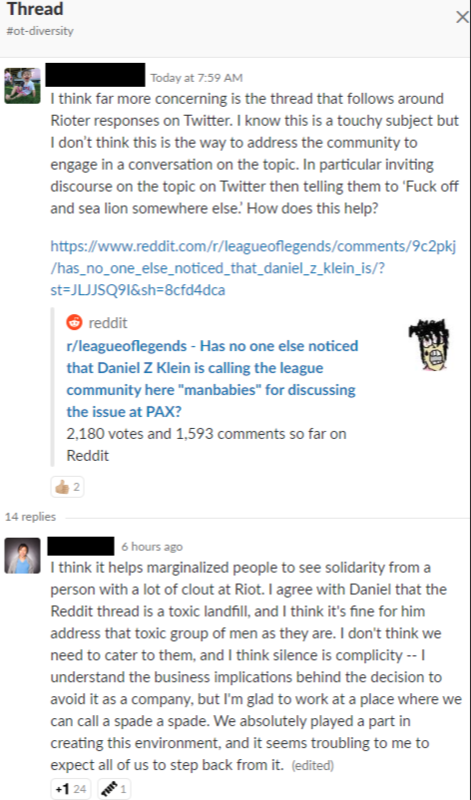 Riot Systems Designer Daniel "Zenon" Klein's Twitter feed saw him locked in what could barely be classed as debate on the matter, including one particular fan going by the name NightZora on Twitter, who he told to "F**k off and sea lion somewhere else", blocking the person immediately afterwards. The messages from NightZora seem pretty innocuous and generally supportive of Riot's initiative, while s​ealioning typically means asking fake-nice questions structured to waste one's time: some Klein followers criticised him for his response. As it appears now, Riot Games stand by their decision to exclude those who identify as men from the panel, even though it means trans men were also denied access. They did note, however, that they expect their employees to "act with respect", no matter how heated the discussion is. Adding to the general odour of the matter, images on Reddit of screenshots claimed to be leaked conversations from Riot's Slack point to some of its staff's own internal angst about how things are unfolding. This prompted the Reddit poster who uploaded the conversations (showing messages from five people that were seen on a limited channel) to conclude that it showed a "decent chunk" of Riot supported Klein. We'll set aside the fact Riot has over 2500 employees before agreeing with that sentiment, and let's not forget the backdrop to this spat is recent evidence of a corrosive culture of sexism within Riot as a company. Slack screenshots from that era have yet to surface, and assumedly if they did they would be as on message and word-perfect as those 'leaked' in this instance. At Riot, who walked into this mess by being accused of deploying more sexism to counteract existing sexism, the internal summary will probably be along similar lines: if you've already shot yourself in one foot, you may as well balance things up by shooting the other. Riot Games will likely further respond to the controversy after PAX West concludes.